Hope everyone had a wonderful Easter spending time with loved ones and eating loads of candy! I celebrated by dressing up like an Easter egg through the entire weekend in all sorts of pastels! I have always been a fan of mustard yellow so this dress by Pepaloves is perfect! 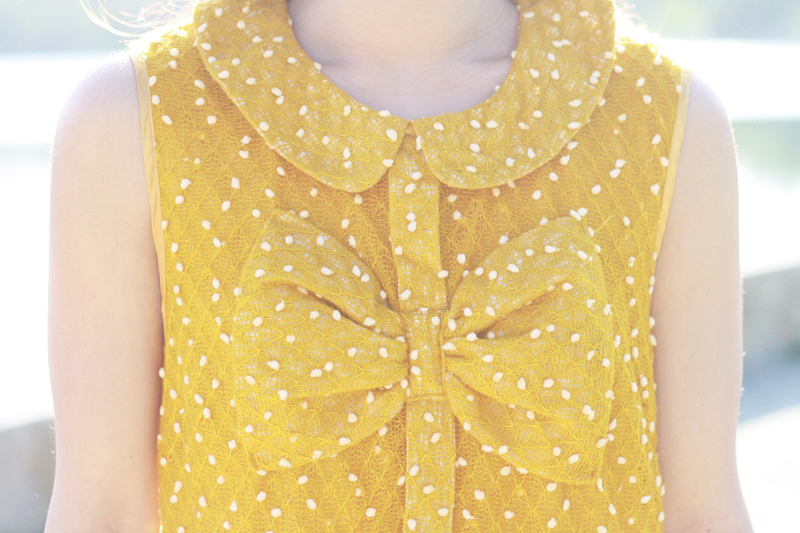 Gorgeous shade of mustard, fun confetti-like dotted details, giant bow on front, and peter pan collar... what more can you ask for in a dress? I love it! I paired it with a cute heart shaped bag and these lovely heeled loafers by Le Bunny Bleu. Bunny! How appropriate! Peter pan collar mustard dress c/o Pepaloves. Bolen mid heels c/o Le Bunny Bleu. Heart shaped bag c/o Handbag Heaven. Thick silver band ring c/o Noul. The dress is simply lovely!